Pt. I😕 You?d think there?d be drugs involve in a drug raid? Pt. 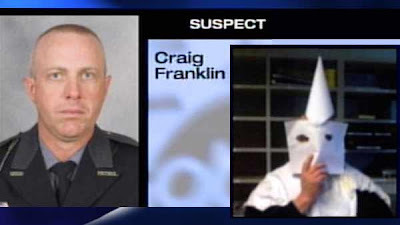 III: Former Patrol leader mislead the Senate Committee about prior Patrol/KKK photo flap. You’ve got the investigation that led to the prior Superintendent of the Patrol to be investigated by the Ohio Ethics Commission. Yep, the Inspector General even had to investigate the Patrol for widespread cheating on annual tests to certify the troopers to use handheld breathalyzer machines. After decades of being treated like an autonomous empire and despite these (and other) incidents, the Patrol struggled with the concept that it needed outside supervision from the agency they are under– the Ohio Department of Public Safety. Strickland’s office grew suspicious of Anchor in June 2008 after labor lawyer N. Victor Goodman placed about a half-dozen phones calls to Kent Markus, Strickland’s chief legal counsel. Goodman was concerned about the possibility of illegal immigrants working on the project, and he raised concerns that Anchor wasn’t paying workers prevailing wages. For this and other reasons, I’ve been told by sources close to the investigation that the Inspector General may issue his report sometime this month.? The expectation is that Charles will continue his history of writing reports with a pro-Patrol bias.? However, I’ve been informed that the Franklin Prosecutor’s Office has made it perfectly clear that it finds no criminal case to be had here. Those on the right hoping to turn a non-criminal tobacco sting and a jurisdictional question on a search warrant into a criminal case that will last through November will be sorely disappointed. More on the 2007 incident in Iraq [UPDATE:] Husted drops out of Springboro Tea Party event, too.